Below is a recent letter from the CRA in response to our appeal on behalf of our client. If you believe you have been erroneously assessed by the Canada Revenue Agency for Director’s Liability or other sections of the tax code then please call us. 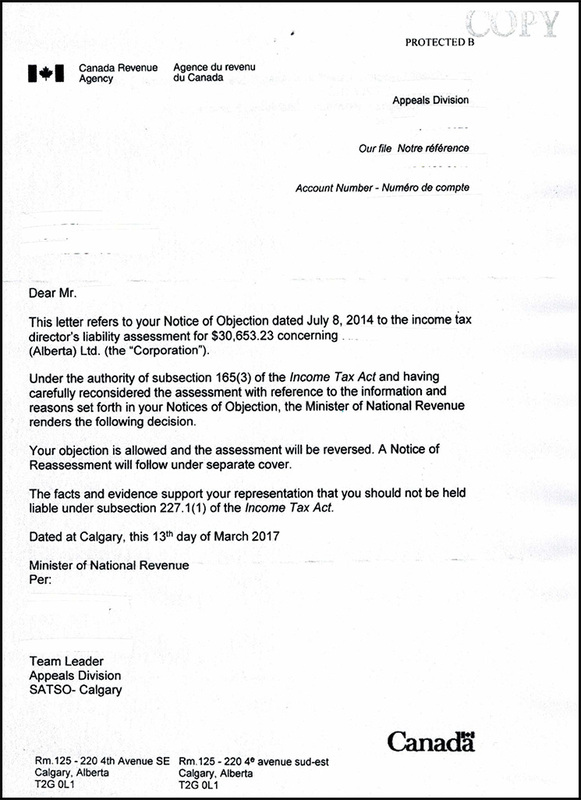 Dear Mr. [name removed] This letter refers to your Notice of Objection dated July 8, 2014 to the income tax director’s liability assessment for $30,653.23 concerning [name removed] (Alberta) Ltd. (the “Corporation”). Under the authority of subsection 165(3) of the Income Tax Act and having carefully reconsidered the assessment with reference to the information and reasons set forth in your Notices of Objection, the Minister of National Revenue renders the following decision. Your objection is allowed and the assessment will be reversed. A Notice of Reassessment will follow under separate cover. The facts and evidence support your representation that you should not be held liable under subsection 227.1 (1) of the Income Tax Act.